In one of our blogs about stock picking strategy, I had shared a very simple stock picking strategy called "Dogs of Nifty", which is an Indian version of the "Dogs of Dow" strategy. To see if the theory really works, I created a finahub portfolio with an initial investment of rough rupees one lakh. Its been 8 months since I created the portfolio and let us see how the portfolio performs after 8 months. Do remember that, as per the strategy, the portfolio composition can be changed only after 1 year. Following is the snapshot of the portfolio after 8 months. The portfolio is running a loss of Rs 11,287.60. Only two stocks (hero honda and ITC) are in green, rest of the stocks are in red. It is still early to say that the portfolio will be in loss and that the strategy failed but still we can analyze the reason for such a bad show as of now. We created the portfolio on Nov 1st, 2010 and as evident from the Nifty index chart given below, Indian markets were soaring at that period of time. 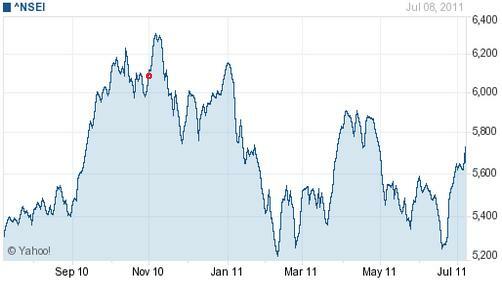 Nifty was around 6100 on Nov 1st 2010 and at 5700 level as of now (11th Jul 2011). The Dogs of Nifty strategy centers around finding index loggerheads but a bull run is not exactly the time to find loggerheads as valuation of all stocks will be affected by the overall positive market sentiments. In other words the loggerhead stocks were bought at a higher price than what it should have been and that will affect the profitability of the portfolio. Having said all that, one needs to remember that the markets behave in periodic cycles and the current market phase is different from that of the month of November. So we will have to wait till Nov 2011 to make a meaning full comparison and the final verdict, until then let's keep our fingers crossed. Let us know what you think about Dogs of Nifty, and it's relevance.